Is your toddler ready to learn reading? Perhaps this is a question that has been floating in your mind lately. I started teaching my toddler son Kaden to read when he was 2 years and 3 months old. He’s one month away from turning 3 years old now. He can read simple words, short sentences, and we’re a few lessons away from completing his reading program. How did I determine the perfect timing to start my son on a reading program? I would say, there’s no perfect timing. Instead, I paid attention. Firstly, I followed my son’s lead and interests. When he was about a year old, I began to notice that he had an interest in numbers, so I bought a simple baby board book on numbers for him. The book captivated him. Soon, he learned his numbers even when he couldn’t really speak yet. At 14 months, he pronounced all numbers as “3”. A month later, he could recognize numbers 1-6. When he was 21 months old, he could use his daddy’s handphone and key in numbers from 1-9 in the correct order. From numbers, he began to develop an interest in the alphabet. At 23 months old, he could recognized the 26 letters. When he was 2 years and 2 months old, for the first time my friend and I saw him arranged his alphabet blocks in their alphabetical order. He loved playing with his magnetic letters a lot. Somehow, he was fascinated by numbers and letters. I would say it’s important to stay alert to your child’s interests and help nurture his interests. Does Your Toddler Sit and Listen When You Read to Him? Secondly, I noticed that Kaden listened when I read books to him, starting from when he was less than a year old. He would even choose books for me to read to him when he was a toddler. When he was 2 years and older, he would also pretend to read by flipping through his books, and staring intently at the pictures. Recently, one of my girlfriends asked me if I read to my son and if my son would listen, and I replied yes. Her son is 11 months younger than Kaden and he is 2 years old now. She shared that she has attempted reading to her son on many occasions, but he just doesn’t have the patience to sit and listen to her. He would turn to the last page of the book and tell his mommy, “Finish!” She was exasperated! I’ve read articles and agreed that different children will develop and unfold in different areas at their own pace. A child who is advanced in language usually might not necessarily be advanced on the socio-emotional front. While other kids might thrive on their physical abilities while not being advanced in their language and speech development. I witnessed that personally last month when I brought Kaden to an indoor themed playground. There was this piece of equipment that involves revolving circular bars that kids can climb onto, stand on them or cling to them for dear life as the circular bars turn round and round. Kaden wasn’t interested or perhaps wasn’t even physically apt to play it. Along came a boy with a pacifier in his mouth, and he looked visibly younger than Kaden. Probably around 2 years old, and he didn’t seem to be speaking yet. Next thing I knew, he confidently held onto the rotating circular bars and stood on them! 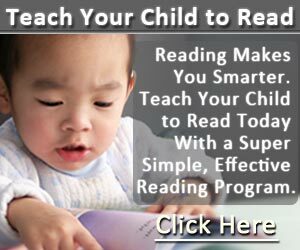 If your toddler or preschooler exhibits signs that she is ready to learn reading, it would be easier to ease her into a reading program. But if her interests lie in elsewhere and she’s not interested in reading presently, perhaps you can try again later. Nurture her interests and let her develop a love of learning first. Reading can come later, when she is more ready. Do you have a comment after reading the above? Share your comment with me and I’d love to connect with you! ← How to Cultivate a Lifelong Love of Reading with Your Toddler or Preschooler? Hello my name is Marsha, and we live in Trinidad, West Indies and I have a 3-year-old. My son started talking at a very late age 1 1/2 years old. We bought him several books and have downloaded several learning games on his ipad that require us to sit and teach him. But the thing is, his attention span seem to be very short and he gets easily distracted and neither the books nor the games hold his attention very long. The teacher at kindergarden has also said his attention does not seem to hold but he will sit once the other kids are sitting. I have tried sitting with him to do work but then he gets distracted with simple things. Currently, he uses his ipad for games such as memory card (which is finding the matching card), and building truck puzzle that requires him to find each part of the truck to put together in place. I would really like to see him counting to 100 or saying his alphabet at this stage. Your advice will help me determine which package I should invest in for him. For a three-year-old boy, it’s quite natural that his attention span doesn’t stretch for long. That’s why I find that the lessons of Children Learning Reading program are designed for teaching younger kids, as each lesson usually take less than 10 minutes to complete. Before the start of each lesson, the parent would have to go through the lesson herself/himself before teaching it to their kid. At any time should you find your son’s attention wavering, you can try to stop the lesson and start again when his concentration is better. The important thing is to let your child have fun with the lessons and not make him feel like it’s a stressful time. So that it won’t turn into a chore for you too. Take it in bite sizes, small chunks of time each time. As for learning the full alphabet and counting to 100, I know that many of my son’s classmates had not mastered these either when they were three years old. It’s all right, let the kids learn at their own pace, as they might be faster in other areas as they each have their own developmental growth pace. For my son, though he was faster in learning his alphabet and numbers as he had a keen interest in these when he was a toddler, he wasn’t doing as well in the motor skills as his peers. And he didn’t learn to speak at a young age either. When he was two, he could say some words, not many. Are you wondering about the standard or premium package of the Children Learning Reading program? Back then, I got the Premium package as it includes Pre-Set Printouts for Stage 1 and Stage 2 lessons. It was very helpful and handy for me to have the pre-set printouts which I simply printed out from my printer using slightly thicker paper for the word cards. I didn’t want to spend extra time trying to create words and short sentences on cards on my own. Having the word cards and short sentence cards pre-set at a good font size and card size made each lesson easier to teach. These pre-set cards also let the parent catch the kid’s attention better.